When we bought our farm in 2002 we fell in love with it on first sight. There was a small mature hardwood forest, a pond, hay fields and some areas that were starting to go wild. There was a definite lack of evergreen trees though - except for junipers. We have added to the fields that were already going wild as well as thickening up our tree lines. We have planted hundreds of tree seedlings that we bought from Quinte Conservation over the years. Varieties include, white pine, jack pine, spruce, birch, butternut, black cherry, nanny berry, tamarack, viburnum, cedar. It has been so exciting to watch the trees grow. Our goal is to always be contributing to the diversity of species on the land. It has been an ongoing project for us to 'rewild' our property. We like to plant things that are native to our area and would possibly have grown here before the land was cleared for farming. The first picture is of ramps or wild leeks that I planted in our woods last year. They seem to have taken to their new home very well. We won't harvest any for a few years to allow them to establish. This photo of a jack pine was taken in early spring and shows how most of the field has grown up in junipers but we've added in a few other evergreens. It's hard to say how old this tree is. We have been working on making some new display beds for herbs in our garden. They'll be used for harvesting and drying herbs for our herbal teas and seasoning too. We're even making name tags for the herbs so people can go on a self guided tour of the garden. Emily was our wwoofer (Worldwide Opportunities on Organic Farms) for the month of May. She did most of the hard work of preparing the beds. Since Hazel thought everything Emily did was awesome she even spent a few minutes helping! Thanks Emily! The blue and white truck is my new herb dryer/greenhouse. It's a work in progress but I finally have someone working on it for me since I don't seem to have enough time to do it myself. More details and photos once it's done. We have been very fortunate to get a lot of great press this spring. Food and Drink magazine featured us on their coveted inside back page. This involved us driving in to Toronto and bringing several costumes for them to choose from and getting a lot of makeup done. It was fun to see how it all happens. I got the job of holding the bountiful basket of goodies which weighed a ton while my honey man stood there with his hands in his pockets! Every few minutes I'd have to put the basket down on a nearby stand. Honey is heavy! The question everyone asks us is 'when is the mead coming?'. We keep saying soon but we really do think it should be ready to sell from our farm store in the next couple of weeks. We have a couple of things left to do but the permit is in place and the labels are approved. I'll make another post all about the mead once it's ready. 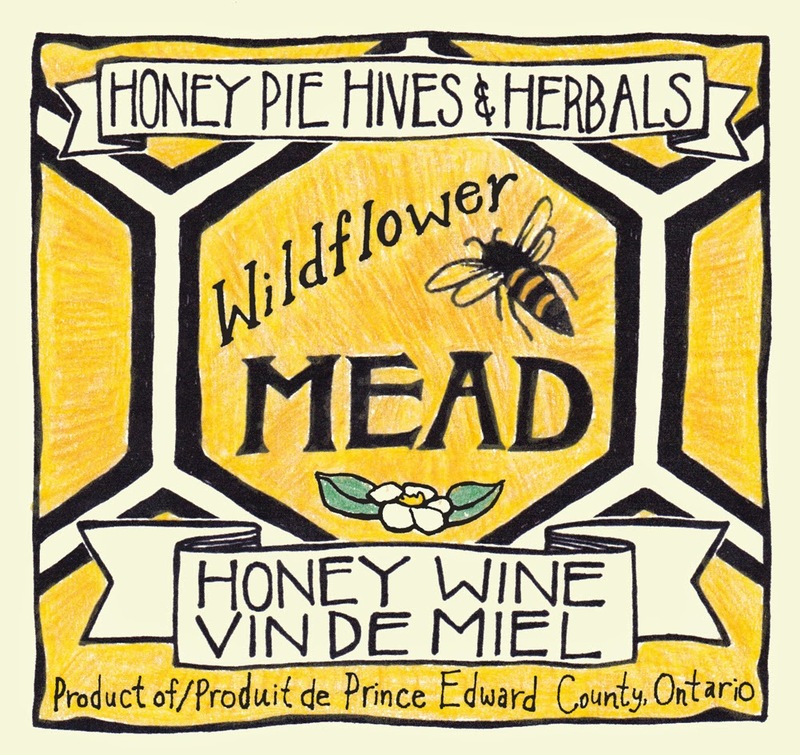 In the meantime here's the label design for our first variety Wildflower Mead which is a traditional style mead made from honey, water and yeast. I've designed five different mead labels over the last few months and am so happy they're finished and I'm out in the garden! Here's our best family portrait yet- taken by my sister on a recent visit to Ottawa. The tulip festival was on and we made the most of it.